In the year 2000, CuChullaine O'Reilly wrote a History of Equestrian Travel as it was then known. Since then, diligent research has uncovered more facts, more amazing journeys, and more intrepid Long Riders from the past. Here then is an updated History of Equestrian Travel, written by Basha O'Reilly in 2012. When asked to name an equestrian culture, the majority of modern humans would think of cowboys and gauchos. What few people remember is that Russia played a remarkable role in horse-human history. A special study documents the astonishing and dangerous journeys made during the last 300 years. 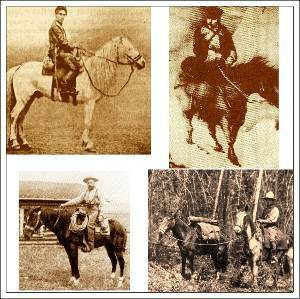 For example, Long Riders such as Alexander Kenik rode his stallion, Irkut, 7,000 kilometres from St. Petersburg to Chita, Siberia in 1895. This unique report documents the women and men who had the courage to ride across Russia, from the days of the Czars, through the era of the Soviet Union, and who are blazing new trails in the 21st century.